Submitted by Mats on Tue, 01/02/2018 - 17:18. There is already a service for analog input thru i2c. It's called Ads1115 and it has 4 A/D channels. You can have up to 4 of them using different addresses. If more channels are needed, you can use an i2cBus. Submitted by moz4r on Wed, 01/03/2018 - 03:26. Submitted by GroG on Sun, 01/14/2018 - 19:31. Great Arm Project Moz4r !! I'm curious how mrl i2c speed control compares to the mrlcomm on arduino. Also, have you thought of raspi as a replacement for the arduino since you have moved to i2c ? We should perhaps start to refactor inmoov so that there are no "startPeer or createPeer" functions inside.. and all is "attached" .. this will allow smoother operation between i2c and other variants. Submitted by moz4r on Mon, 01/15/2018 - 06:46. 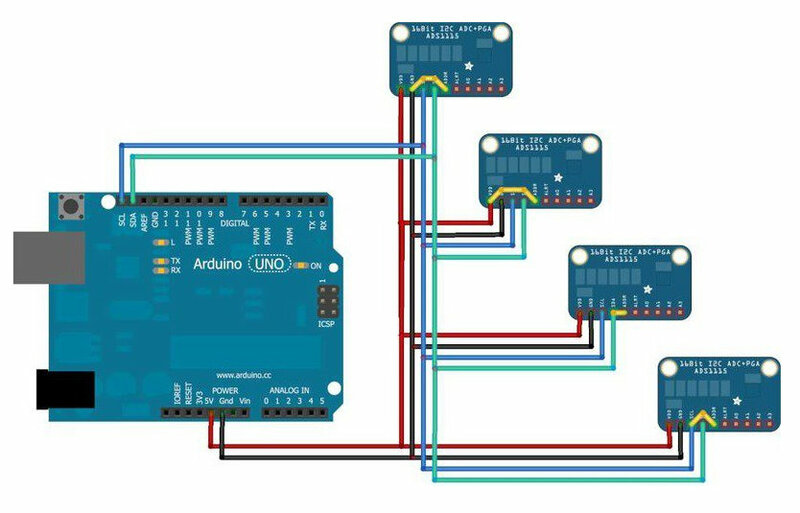 I still use arduino as main controller board for other skeleton parts, and to connect i2c things onto. But maybe will test a remote adapter raspi for servo later ! Few test speed control seem very worky, but I remember some discussions about frequencies that can cause troubles , maybe Mats can bring some light about it. Submitted by Ray.Edgley on Sun, 01/21/2018 - 22:59. I don't see the Raspberry Pi 3 as a replacement for the Arduino Mega's in the Inmoov, but rather a replacement for the tablet in the back of the Inmoov. The Arduino's can be connected to the Raspberry Pi 3 via the USB ports as you would with the tablet. There is a lot of functionality that the Arduino's running MRLcomm have that is not possible at this point with the Raspberry Pi such as the neo pixel library. The real advantage of using the Raspberry pi is the I2C bus built onto the controller, and if used with two Arduino Mega 2560's as is the common arrangement, that gives up to 3 I2C busses without having to multi plex. If you add multi plexing, then there is a lot of capacity for expansion. There is also the possibility of adding devices such as the Intel movidius Neural Compute Stick. This can be used for AI computer vision and is where the Raspberry Pi 3 will come into its own over a tablet. The down side is there is not enough processing power to train the neural network using a Raspberry Pi 3. Submitted by dom14 on Mon, 01/15/2018 - 10:27. It's been a long time since I've done the same thing but in usb, much simpler than I2C. The length of the wires will give you problems. Submitted by dom14 on Mon, 01/15/2018 - 11:35. Submitted by moz4r on Tue, 01/23/2018 - 17:03. First report after some days use, it is worky PERFECT ! ( no problems with wires length , I use a armored rj45 as extention ) . Tested also without any arduino for people that don't use it.